Ryegrass HorseHage is made from a selection of ryegrasses cut at an earlier stage of growth to provide optimum protein and energy levels. It is suitable for horses in work or for those that need a little more from their forage to improve weight and condition. 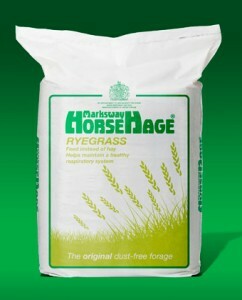 Ryegrass HorseHage is great for hunters, heavy horses, young stock and breeding stock. It helps to meet a much greater proportion of their nutritional requirements than other forages, enabling hard feeds to be reduced by up to a third, allowing a more ‘natural’ diet which the horse’s digestive system is designed for.